Winner of the 2017 National Book Award for Poetry. The collected poems of three time Pulitzer Prize-finalist Frank Bidart. 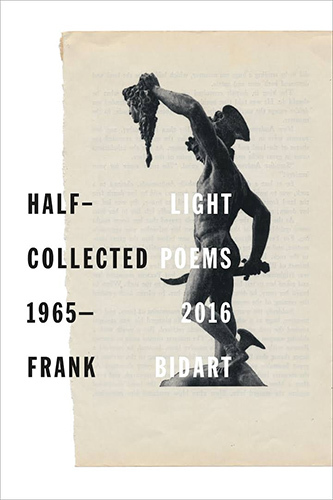 The publication of Half-Light: Collected Poems, 1965-2016 gives readers a chance to see how Bidart, ill content merely to 'say what happened' in prefab stanzas, performs a poetry of 'embodiment' first by adopting personas — most famously those of the necrophiliac murderer ... The scale of these poems is cinematic and their reach reveals the extent to which Bidart’s classical mind is adept at plucking allegorical tales and figures from Western literature and history on which he can graft his own life story, and also ours ... The danger of a career-encompassing volume like this one, especially for a career as prolific as Bidart’s has been, is that the greatest poems tend to overpower the minors. This is especially true in his later volumes, which conspicuously mark Bidart’s turn toward social and political issues like race relations or the poet’s own identity as a gay man. But even here, Bidart’s seething intellect and ruthless gaze register grace and wisdom ... Let’s pray his poems continue to aim at the most pressing issues. We need new examples of ways to be free, to slip the constraints of art and life. A more predictably chronological walk through the decades might have highlighted the way in which Bidart’s work has evolved with experience; this more inventive sequence invites a different sort of insight. It’s true that the poems from the ’60s and ’70s, composed before Bidart found his full voice, are more straightforward, more conventional ... Yet what this ordering makes apparent is the remarkable consistency and unity of Bidart’s work over time. 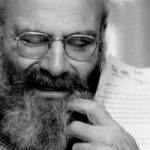 This is partly a matter of the tools and techniques he has discovered and honed over thousands of lines; in particular, his highly expressive and idiosyncratic use of punctuation and capitalization, and, closely related to this, his distinctive way of arranging words on the page. More than this, though, the unity of Bidart’s work is thematic and psychological; it represents the highly crafted outpouring of a troubled consciousness persistently grappling to comprehend and accommodate a difficult and disturbing world, a world that seems inherently hostile not only to being mastered or comprehended, but at times to human life itself ... Part of the accomplishment of his work is that this technique ends up generating an odd form of intimacy: rather than feeling excluded, the reader feels complicit in the psychological struggles depicted in the poem, an active participant rather than a mute witness ... These rich and hypnotic poems are, to my knowledge, not much like anything else in contemporary American poetry. Made up of the seventy-eight-year-old author’s eight previous volumes of verse and a new sequence—the bold and elegiac 'Thirst'—Half-Light is both the culmination of a distinguished career and a poetic ur-text about how homophobia, doubt, and a parent’s confusing love can shape a gay child ... His style is marked by a kind of calm hysteria, or a calm that alternates with hysteria, as he struggles with the things that the straight world and his formerly closeted and frightened self think should remain unsaid ... Bidart’s poems are a kind of séance, one in which he tries to invoke and communicate love, even if that love can no longer be achieved, tasted, seen, touched. The poems that Bidart wrote for his lost ones are a testament to the conversations he holds in his head, written with force from the confines of a limitless gay body. What did you think of Half-light: Collected Poems 1965-2016?